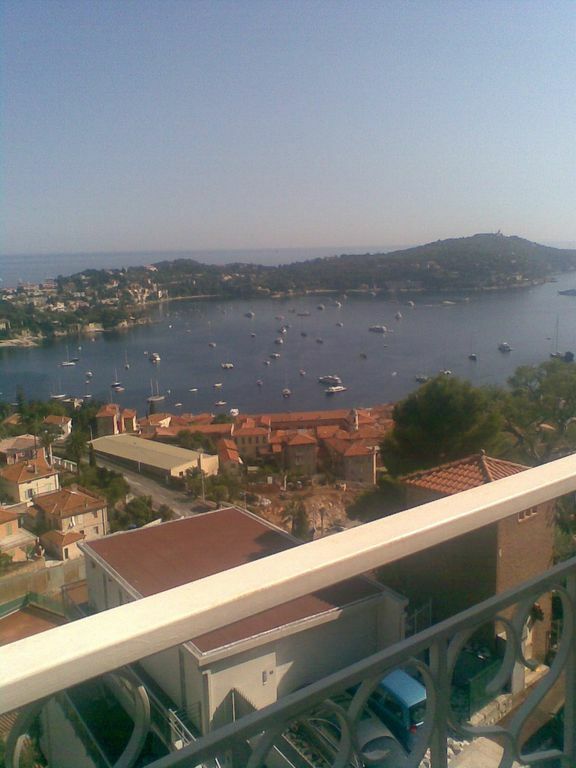 Self catering, bright, spacious apt with stunning views over Villefranche Bay. Two bedrooms, 1 double, 1 single, large living area with modern fully equipped kitchen. Large balcony, with ample sitting area. Bathroom with power jet shower. Large flat screen TV and DVD player. Ideal base for touring the Riviera, very close to public transport and main roads. 5 mins to beaches/ port of Villefranche. Adjacent to Beaulieu -sur-Mer and Nice. Relaxing Holiday: This apartment is a ideal setting for a relaxing, enjoyable holiday, in a stunning environment in one of the worlds most popular, tourist areas. Whether its shopping, swimming, sunbathing, sailing or visiting historical attractions that you are interested in, you will find them all easily accessible in Villefranche-sur-Mer. The facilities in the apartment allow you to cook and eat comfortably in your own space, while enjoying the stunning views of the Bay of Villefranche and the Peninsula of Cap Ferrat.You can also enjoy a DVD in comfort, in the apartment. (selection of English language DVD's available. Alternatively, there are numerous restaurants and bars within walking distance, with a range of prices to suit all pockets. The old town provides a beautiful backdrop to the port and beach at Villefranche and adds to the magic of the setting. Bathroom with power jet shower, vanity unit and toilet. Private secure car park adjacent to building. We loved Viille France.The property did not spoil our holiday.But there are many things that need sorting.The bathroom is smelly and is beyond cleaning proper.The shower cubicle could make you ill.It is mouldy and there is no way of cleaning it. The toilet needs attention.The washing machine has got notes on it to use the door carefully otherwise it will brakes very scary to use.The floors are well worn.The shutters on the doors are past it.So in the heat you could not use them proper.It is advertised as sleeping 5.There is 1 double bedroom and 1 single.The other2 have to sleep on the sofa bed in the lounge.There are no wardrobes in the single bedroom.So if you went with 5 people there is only a wardrobe in the double bedroom.There is an iron with the cables exposed.The list goes on.Summing it up the property needs to be taken of the market and brought up to standard.The only good thing i can say the view is very good.We feel we have been duped by the way the property looks on the internet and it certainly not worth the money charged.The reason we gave it four stars is Ville France is lovely not the property. In responding to your feedback, I take on board any specific criticisms you make regarding our property, such as the iron and the floor. Other comments that you make are general and do not indicate exactly what is wrong with those items. We were there the week before you and the bathroom certainly was not smelly, neither was there anything wrong with the toilet. What does it mean the 'the toilet needs attention' ?? If you found something wrong with these things, why did you not contact me or my caretaker whose number you had, to come and remedy the situation? My caretaker left the bathroom perfectly clean for you. If you noticed mould in the shower (which neither I, my caretaker or any other client has noticed this previously) you should have let me know immediately and I would have directed my caretaker to deal with it. Our shutters work fine and have never been commented on negatively. Again you make a general comment they 'are past it'? without any specific information. What does that mean?? We only advertise for 4 people, so the double bed, single bed and the fold out single bed are in use but not the sofa! I agree there is no wardrobe in the single room but you conveniently didn't mention that there is a tall chest of drawers with 5 drawers in that room instead. You say 'the list goes on' What list? There are no other concerns that I am aware of. Again you make negative comments with no evidence. I will certainly look after the 2/3 specific items that you refer to, but since all other issues are mentioned in general, negative but non - specific terms, I cannot understand exactly what you are referring to. You could have let me know of your concerns on arrival and these would have been dealt with immediately rather than continuing your 2 week stay and then posting a review almost 2 months later when we could not address the matter and improve your stay. Therefore I find most of your comments grossly unfair, and creating an unnecessary negative image of our property that is frankly unsubstantiated and in most cases, without clear and proper evidence from you. We really enjoyed our 6 day stay at Celia’s apartment. The view from the balcony was spectactular. The weather was beautiful and we often had a drink or ate on the balcony. The apartment was very clean and everything worked well. We brought a car and there was gated off street parking. We drove often down to the beach, to visit the old town or to visit nearby towns. So pleased that you enjoyed your stay! Great apartment. Amazing view and large balcony to sit and watch the harbour activity in Villefranche. Delighted that you enjoyed your stay! We love the view too! Lovely Apartment with a Gorgeous View! I just spent a week in this great apartment with my mom and boyfriend. We did not have a car, and used public transportation (and the stairs!). If you plan to do the same, keep in mind that the bus up the hill stops around 18h30 each night, or you’ll be in for a long walk! The apartment is lovely and comfortable, with an amazing view. Some thoughtful touches included tea, a corkscrew and plenty of dishes and utensils. The owner communicated very well with us before our stay. un appartement parfaitement bien situé avec un grand balcon donnant un atout de cette belle vue sur la baie de Villefranche Sur Mer. Idéal comme point de départ pour sillonner la côte d'azur. De plus la Rade est très belle. L'appartement est spacieux, confort correct, est bien équipé, propre, calme, reposant, tout est super pour passer une escapade ou vacances plus longues. De plus une gardienne très arrangeante et accueillante dont kit de serviettes de toilette et kit pour la cuisine est à disposition qui est bien appréciable. Un petit parking à disposition avec bip permet de garer sa voiture. Une propriétaire très gentille dont les échanges se sont fait par mails. Séjour très réussi et je suis enchantée de la prestation. Je ne peux que recommander cet appartement et je reviendrai avec grand plaisir. The apartment is located in Villefranche-sur-Mer on a hill overlooking the Bay, between the two main roads, Base Corniche and Moyonne Corniche. It is 10 mins by car or public transport to Nice, with its many shopping centres, beautiful open squares and magnificent beach. It takes 25 mins to Monte Carlo, by train, car or bus. Trains and buses can be accessed within 5-10 mins walking. The beautiful ports of Beaulieu-sur-Mer and Cap Ferrat are close by with their numerous waterside restaurants. The old town, beach and port of Villefranche are approx 5-10 mins walk away. There are numerous shops and a wide variety of restaurants in the town. Many beautiful historical buildings can be found in the town and are easily accessible. A deposit of 20% is required to confirm a booking, with the balance to be paid at least 2 weeks before arrival at the apartment.